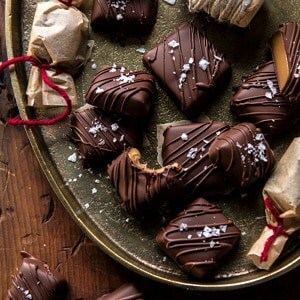 Salted Chocolate Covered Bourbon Cider Caramels. 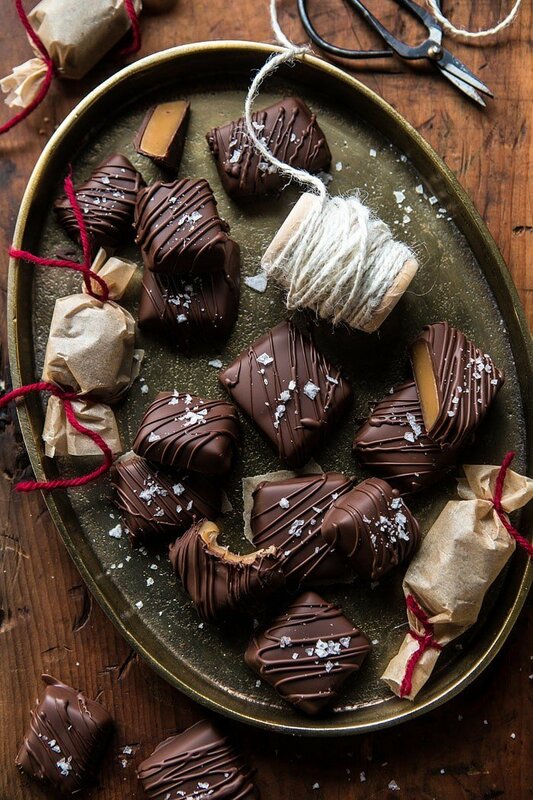 Trust me when I say, your Friday night needs these Salted Chocolate Covered Bourbon Cider Caramels. Not sure about you guys, but it’s been a pretty busy week over here. It’s just that time of year I guess. 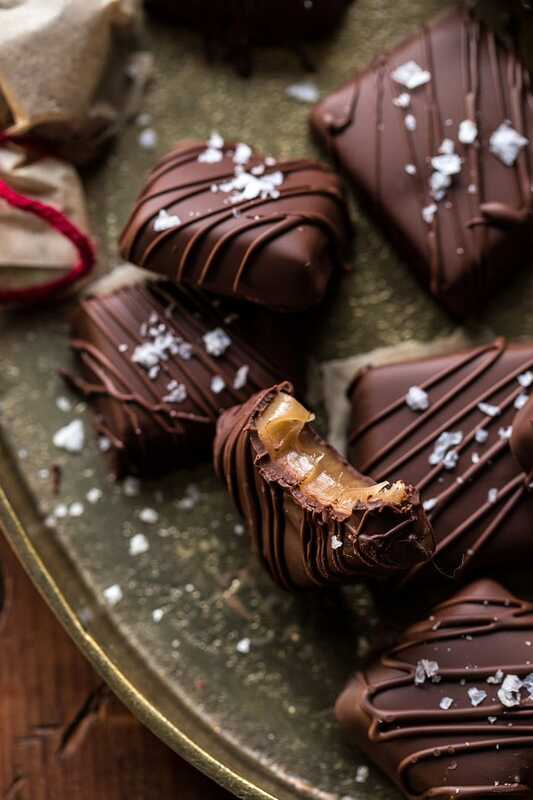 I have to say I’m looking forward to a good Friday night-in, with a side of candles (I am seriously so obsessed with candles right now) and plenty of these chocolate covered caramels. I know, I am so predictable, homebody forever and ever. In my defense, I spent most nights this week working away, and last Friday night I was on a four and a half hour plane ride back home from NYC. So tonight calls for a chill night. In the morning it’s back to work on a super fun holiday project (which really does not feel like work, I’m excited to shoot this). On Sunday and Monday I’ll be filming videos with Kai, then Tuesday it’s off to Cleveland. I have a quick interview on Wednesday with a local news station (it’s actually a joint interview with my little brother, Red…should be interesting), and then from there it’s off to my Nonnie’s kitchen I go, because I have thirty plus people to feed for Thanksgiving. Anyway, my point in all this rambling (sorry) is that tonight needs to involve these chocolate covered caramels. Even if your week wasn’t a hectic one (lucky), I can almost guarantee that most of you need a little chill time and a little chocolate before all the festivities that next week will bring. 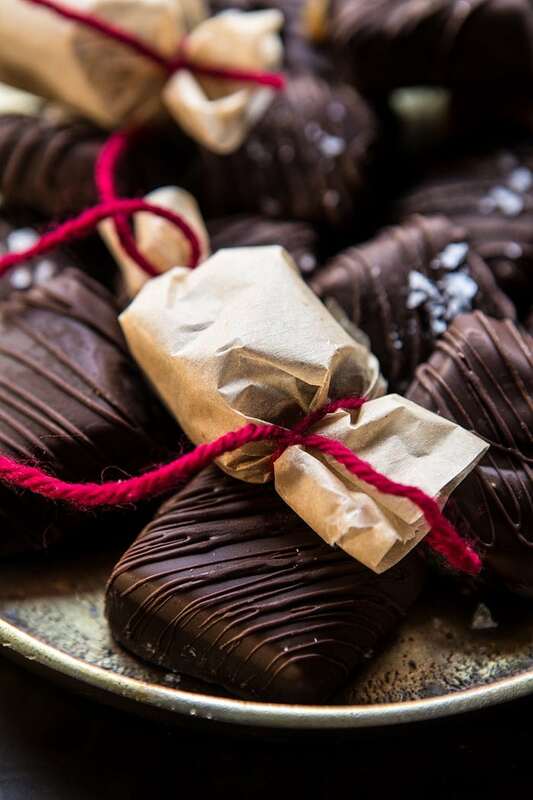 Thanksgiving week is always a little hectic, so I’m taking tonight to just breath, make chocolate, and then eat chocolate while watching a Christmas movie and smelling my new Christmas candles…very, very smart idea. Great! Now that we’ve got our plans for the night all settled, let me actually tell you about these caramels. Normally, caramels are not my go-to when it comes to sweets, but any time I can home make them I’m singing a different tune. Homemade caramels, especially soft and chewy homemade caramels, are the best. Nothing can beat them. Every holiday season I usually make some form of caramels to include in my cookie boxes that I send out to friends, family, and people I work with (I may have missed a few last year…). I always include cookies, chocolate covered pretzels, and caramels. Even though I make caramels every year, I’ve oddly never told you guys about them…until now that is. I made these bourbon caramels the other week and as soon as I tried one, I knew I had to share the recipe. These are perfection in every single bite. Sweet, buttery, gooey, soft caramel, covered in semi-sweet chocolate. 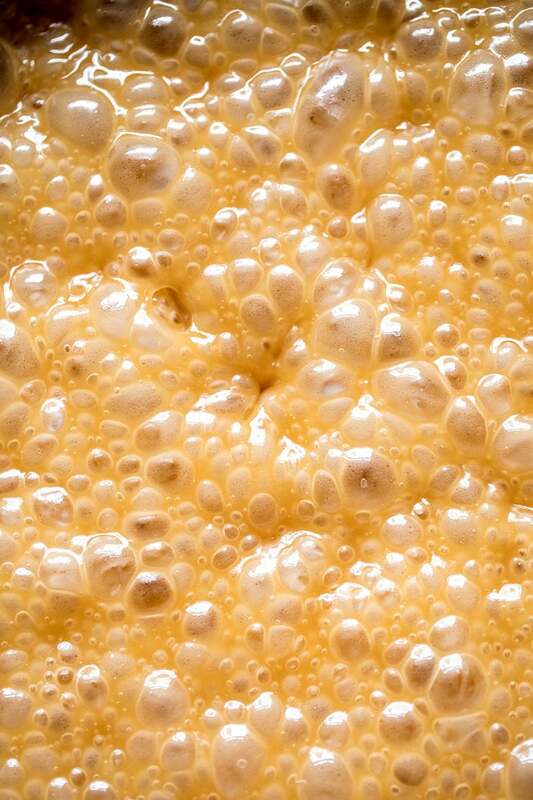 I know caramel can sometimes be intimidating, but guys I promise this recipe is simple and easy. 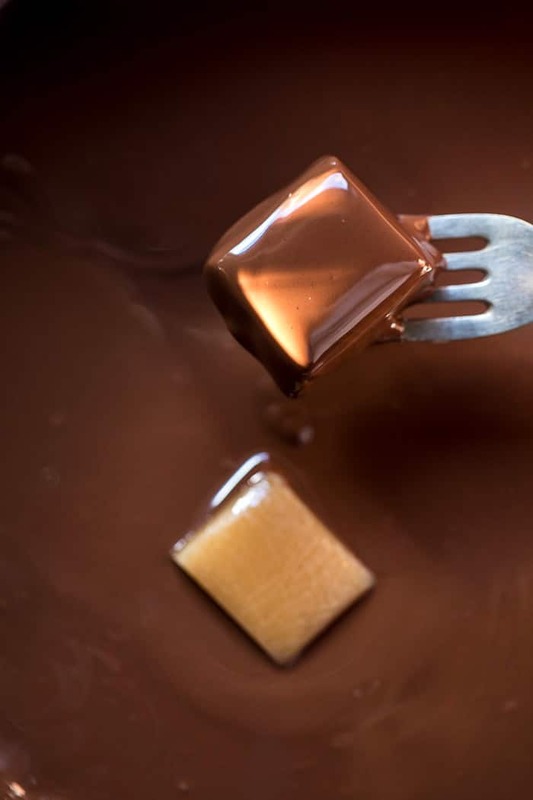 Just boil your ingredients until they turn into caramel, pour the caramel into a baking dish, let it set, cut into squares, and cover in chocolate. Simple. The only thing I have to say is that a candy thermometer is needed. 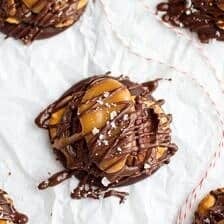 I know it’s kind of a pain if you don’t often make homemade candies, but having a thermometer just makes making this recipe a million and one times easier. 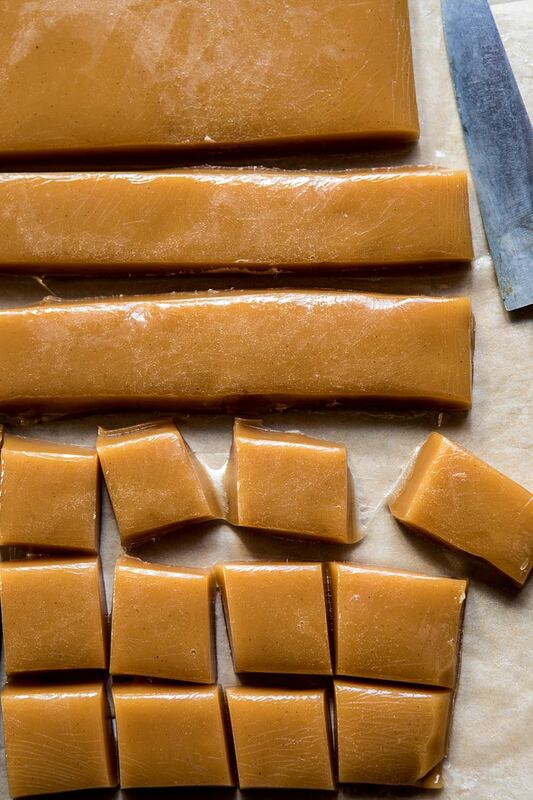 It takes out all the guess-work and leaves you with perfect, soft caramels every time. If you don’t own a candy thermometer, I have this one and love it. Unlike classic caramels, I decided to make these with apple cider. The cider adds a nice spiced flavor to the caramel that pairs so well with the bourbon and chocolate. It’s such a good flavor combo, and perfect for the holidays. Once the caramels are covered in chocolate, I like to drizzle over just a little more chocolate and then sprinkle them with flaky sea salt. The drizzle of chocolate adds a little texture and the flaky sea salt is just really, really, delicious. The best part? 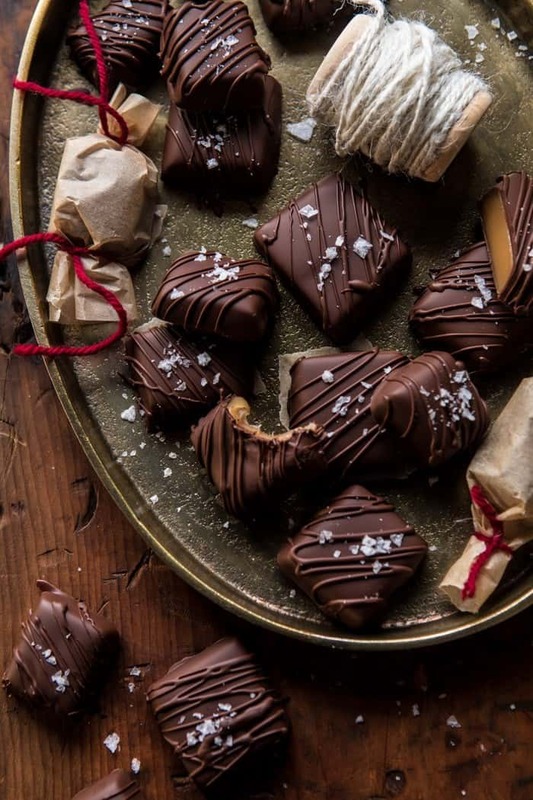 You can wrap these up to use as holiday gifts…just be sure to double the recipe…because you’ll need to save a batch for yourself. 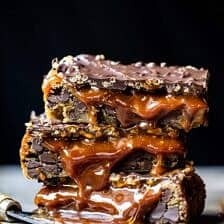 Simple and easy recipe, just boil your ingredients until they turn into caramel, pour the caramel into a baking dish, let set, cut into squares, and cover in chocolate! 1. Line a 9x13 inch baking dish with parchment paper. 2. In a large saucepan, combine the apple cider, heavy cream, sugar, honey, and butter. Bring to a boil over medium-high heat, stirring occasionally until the mixture reaches 244 degrees F. on a candy thermometer, about 12-14 minutes total. 3. Remove from the heat and carefully stir in the bourbon and vanilla. Return to high heat and bring the mixture back up to 244 degrees F. Remove from the heat and carefully pour the caramel into the prepared baking dish. Let the caramel set up at room temperature for 4 hours or up to 1 day. 4. Lift the caramel out of the pan and cut into 2 inch squares. Place each on a parchment lined baking sheet and transfer to the freezer and freeze 20 minutes. This makes coating in chocolate easier. 5. Melt the chocolate and let cool 10-20 minutes pior to dipping. 6. Dip each caramel in melted, cooled chocolate and place on a parchment lined baking sheet. Repeat with the remaining caramels. Sprinkle with flaky sea salt. Place the caramels in the fridge to set for 20 minutes. Store in an air-tight container for up to 2 weeks. The most perfect chocolate bite. PS. I hope these have you excited for what’s to come this holiday season. I cannot wait! Mocha Caramel Crunch Chocolate Chip Cookie Bars. I don’t like caramel – even thinking about it makes my teeth ache!! – but these are probably hands down THE most beatiful I have ever seen. I actually wanted to eat them, so they look that good indeed! What do you think about leaving out the bourbon? I want to make these today but don’t have any at home and don’t want to run out….feeling like you and wanting to just be a homebody. HI! Yes, you can totally leave the bourbon out. Not a big deal. Please let me know if you have other questions. Hope you love this recipe! Thanks! 🙂 ps. hope you had a great night at home! Oh, lordy. Now I can’t decide what to bring for Thanksgiving dessert. These look fantastic. I was leaning towards the Chai Pumpkin Pie, making it with full fat coconut milk per your suggestion, but we already have a pie and we’re a small group now (5 adults),so I thought a cookie or candy might work. Can I do this with the coconut milk, too?? If so, I’m totally making them. Can you say AWESOME! That how these caramels look. Can’t wait to try them! I hope you love them Lury! Thank you! These look perfect and really looking forward to making these over winter break (a perfect project while staying inside and watching Christmas movies 😉). Haha I was just looking up candy recipes the other week and think theses work beautifully! I love the flaky sea salt (maybe pink hymillaian salt would look nice?) and think they would be the perfect gift! I hope your flight goes well with everyone and the dog 😳. When will you be picking out your Christmas tree then? Didn’t you say you normally do that on thanksgiving? I hope cooking in your Nonnies kitchen helps you and your mom feel warmth and love during the holidays. Stay warm and I hope you have a restful weekend! Hi Kristin! These would make for such a lovely gift! 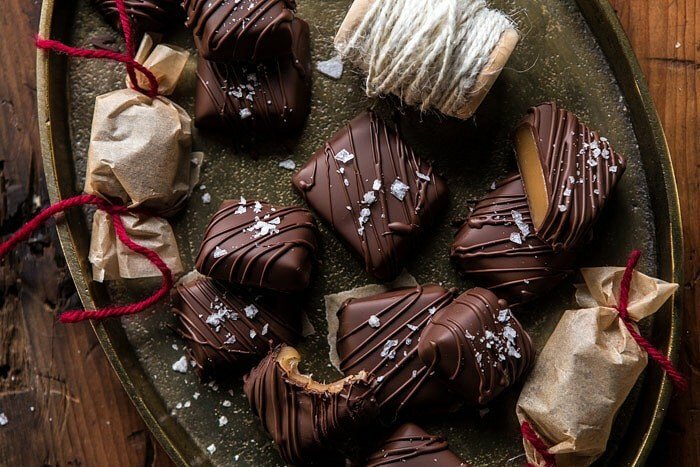 Can’t say no to making these while watching Christmas movies.. sounds amazing! I hope you love these and have a great holiday! 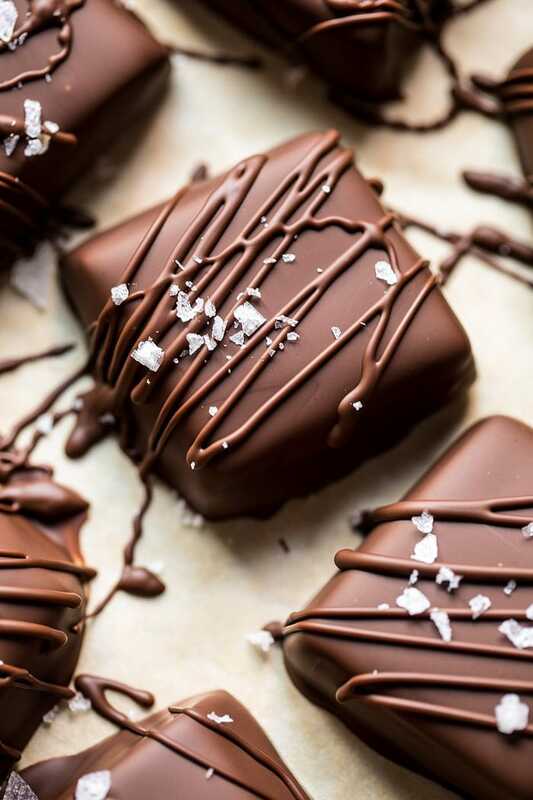 These chocolate covered caramels look like they are beyond scrumptious. And your photos are gorgeous! Such a wonderful idea for Christmas gifts for friends and family. I love the idea of bourbon and cider. What a perfect recipe for the season. Thanks so much for posting. Thank you Kristy! I am so glad you like these, and hope you love them when you try them! Unfortunately this recipe was a dud for me. The flavors were just all off. The apple cider makes the caramel almost tart in a way, the alcohol (of which I quartered) was overwhelming and you just lost all the butter, creamy sweet taste that comes with caramel. It wasn’t like eating caramel at all, more like eating a skittle. My gut told me to start with a half batch but it sounded so good I went ahead and made a full batch and now I am pretty bummed I wasted all those ingredients. I have tried the caramel several times over the extent of the day thinking maybe it would grow on me and I actually think it is worse each time. Not even worth wrapping up and keeping. Will go in the trash and will stick with my traditional caramel recipe from now on. I have these cooling right now and I am SO excited. I have never made candy before and I am 99.9% sure it worked! I can’t believe how easy it was and feeling pretty proud of myself 🙂 can’t wait to dip them tomorrow and I even got PINK salt for the tops. Thanks for this recipe for a sweet Christmas treat that will travel well— cookies seemed a bit too crumbly so I am excited to have something homemade to send my far-flung family this year. I hope these turned out amazing for you and you love them! Thank you Brit! I love your recipes, congratulations !!!! What would you use if you can’t find apple cider? This look amazing! I️ have some apple cider that I️ need to use up so these are perfect. Question…did you dip them in chocolate, let it set in the fridge, then drizzle with more chocolate? I️ want to know how to get those perfect lines! What brand of chocolate did you use? I have ¼ batch cooling in the freezer now, but my chocolate doesn’t look like yours, Also, the caramels were quite soft and I found that I needed to freeze them before I dipped. I will admit I’m not a very accomplished candy/chocolate maker…and thus I would not qualify this recipe as easy. omg I just had the same problem – and had a minor temper tantrum about it. I feel like there’s something missing here – melted chocolate chips are way too thick, and way too hot on room temperature caramels. What gives, Tieghan? Hi!! If you don’t have bourbon, what other alcohol would you recommend substituting? Thanks! Hey girl! I’m usually a huge fan of your recipes but I feel like there’s a step missing here – for the chocolate, I just melted a ton of chocolate chips and it’s too thick really to coat the caramels thinly. And then there’s the problem of the chocolate being 1000 degrees, so it melts the caramel too. What’s going on? Can you flesh that out a bit more? There has to be more than just: Melt chocolate, dip very soft caramels in molten chocolate, watch your work literally all melt. Hey Katie! I am SO SORRY for the trouble. I should have mentioned my tips for dipping caramel in chocolate. See below! Also, I don’t recommend using chocolate chips. They don’t melt like a chocolate bar and making dipping food hard. Again, I am so sorry for the trouble. Let me know if you have other questions. Thanks! 6. Dip each caramel in melted chocolate and place on a parchment lined baking sheet. Repeat with the remaining caramels. Sprinkle with flaky sea salt. Place the caramels in the fridge to set for 20 minutes. Store in an air-tight container for up to 2 weeks. Thanks Tieghan but unfortunately this came a little too late. I had made the caramels, and wasn’t sure how to store them while waiting for instructions on chocolate, so initially froze but then moved to the fridge where they all managed to melt together anyway. I tried to save them, but in the process of prying them apart I stabbed myself in the hand. So I think this experiment has officially failed and I’m probably not gonna try candy making again for a very long while, if ever. 🙁 Major bummer. I would also categorize this recipe as intermediate at least, and I’m a major baker/cook and woof candy making is a very different beast. Awh I am so sorry to hear that! I really hope your hand is alright! Candy can be super hard to make, I wouldn’t give up on it though! Just have to make it a few more times! Sorry again Katie! This is too sweet! Thanks! WOW these looks simply insanely delicious!!! 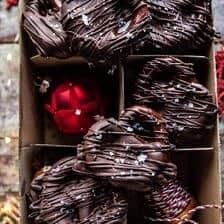 These chocolates look and sound amazing!! You will totally love these then! Thanks Carol! It came very well as I see it the picture and I like the taste of salted chocolate.Thank you so much for sharing…. I am glad you liked these! Thank you! 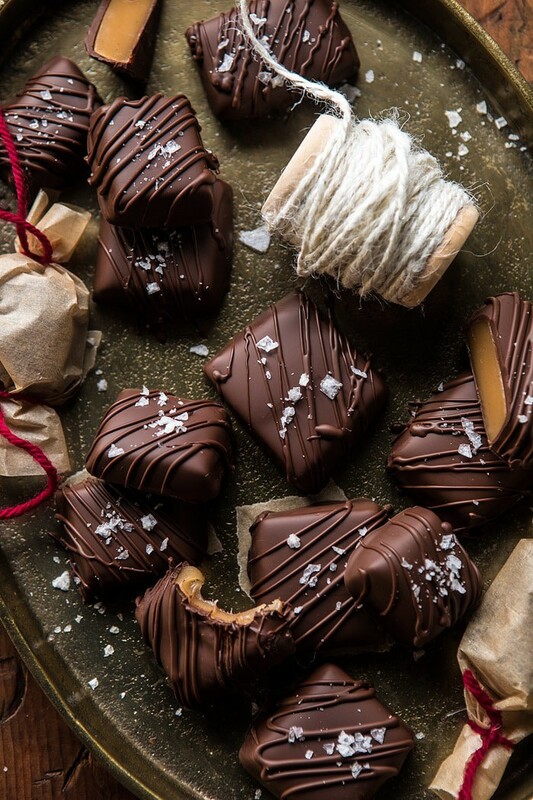 OMG those choco bars look delicious, so much more that a little bourbon is included! Every word in that title made me drool a little more as I read it. These look too easy and good to be true, pinning for Christmas gift ideas! I am so happy you like this Kelly! Thank you so much! i live in puerto rico and we dont have access to apple cider. csn i just substitute with apole juice? can’t wait to make these. Sorry for the gramatical errors, did it from phone. I’m all set to make these but have brandy instead of bourbon. Do you think it will work? Thanks! Thank you! I am so glad you like this! Thanks for the recipe! i have these cooling in my kitchen now, can’t wait to dip (and eat!). I’m pretty sure I’ll be handing out at work as a holiday gift if they turn out ok. Question– when i poured into my 9×13 they seem awfully thin, have you tried making them thicker, say in a 9×9? Or would that affect how they set up too much? Also, i started in my 2nd biggest sauce pan and had to transfer to my biggest/pasta one halfway through, i didn’t expect it to bouble up so high! wow! I’m about to make my second batch of these. Holy crow, I can’t believe how good they are! My boyfriend came home after I made the first batch and couldn’t believe how professional they looked, let alone tasted! I’m planning on making my second batch to give away for Christmas instead of buying chocolates this year. Can I ask what you used to wrap them up individually? Is that just regular parchment paper? Thanks again Tieghan! I swear every recipe is better than the last! For anyone who is about to try this recipe. Think twice! I just did and it was a melty mess! I had to continuously over and over put the caramels in the freezer to keep them from spreading into blobs once put out at room temp. I had to freeze and refreeze and refreeze just to get them into to an approximate shape of a square and while I am shaping them the others are spreading right back out again! SO FRUSTRATING and TIME CONSUMING. I followed the directions to a T and I took them to the hard ball state. I am afraid to give these candies as gifts for Christmas as I had planned because if I am having this much trouble getting them to not turn into a sticky pile of glue at room temp how can I expect this not to happen to the giftie?? I can’t even imagine how difficult it will be dipping these into melted chocolate tomorrow and then attempting to make them look presentable!!! Also, another note about the taste, if you LOVE honey you’ll like these but if you are not a honey fan then don’t bother. Honey is definitely the dominant flavor here. Not caramel. I have to agree with katie and Sabrina, this was a bust for me. I’m also a former chef and no stranger to candy making, caramel in particular, but the flavors didn’t meld right and required a lot of extra ingredients and manhandling to get it to perform, and I still was not pleased with the results. 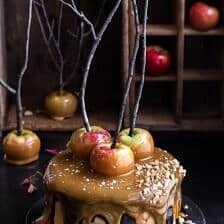 I’ll make something like this again, but use a different caramel recipe. Hi Rachel! I am so sorry this did not work out for you. I hope some of the other recipes on my blog do and you enjoy them! Thank you! I misread the recipe and added apple cider vinegar instead of apple cider. Best mistake ever! The vinegar cuts through the sweetness and makes the flavor so delicious and bright! I am really glad you still enjoyed these Joanna! Thank you! Made these as Christmas gifts and they were a huge hit! It was my first time making candies so coating them in chocolate was a challenge personally, and I quit after coating half the batch. This recipe makes so much though (seriously my large saucepan could barely contain the caramel) that I still had more than enough for everyone. Ended up using the rest of the caramel swirled into a batch of brownies, which was ALSO a huge hit. The caramel just makes everything it’s in 100000x more delicious! I am so glad these turned out well for you Jade! Thank you! Que delicia, vou fazer para meus filhos esta semana. what can I substitute for the cider? This recipe sounds delicious. I would like to ask if your chocolate ever gets the white color, after your caramels sit. I have read that if the chocolates get any type of moisture, this is what causes this to happen. What is the difference between chocolate chips and the bar chocolate? I made this today and followed the recipe to a T and it just tastes like honey….like gooey straight up honey. Good, but not what I made it for. Hi Jayme! I am so sorry this did not turn out well for you. Is there any questions I can help you with? Please let me know! Hi Lynne, I am sorry, I am not sure what you are saying/asking. Can you please clarify?